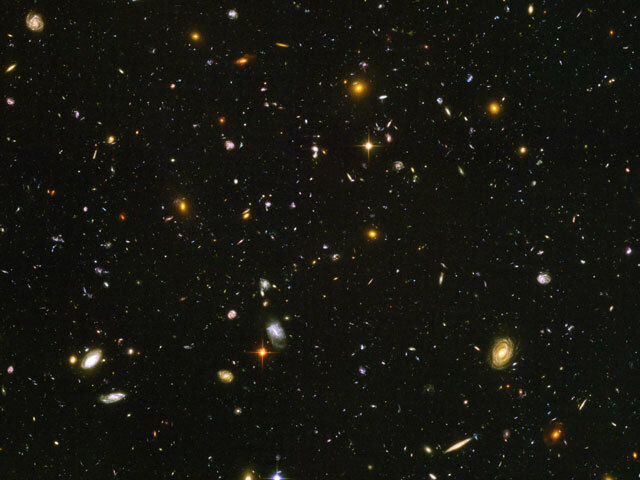 This is the picture released by NASA a couple of weeks ago, showing the deepest view yet of the early universe, taken by the Hubble Space Telescope's Ultra Deep Field Camera. Nearly every speck of light that you can see in it is an entire galaxy; it is a view of only the tiniest section of the sky. 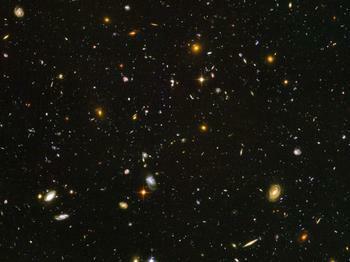 Pictures like this one illustrate the tremendous vastness of the universe and make me feel very, very tiny. I am sometimes given to thinking of God as the master experimental scientist, who sets the physical parameters for the universe - the fine structure constant shall be this, Planck's constant shall be that, the speed of light shall be just so - and then kicks back and watches the great experiment unfold. Looking at early universe pictures like this one truly does make me feel closer to God. I suppose that's a bit cliché, but there it is.